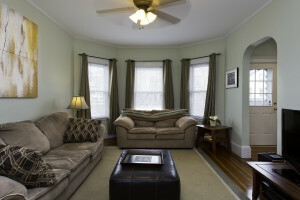 This bright and sunny condo is located on one of Somerville’s prettiest side streets at 31 Adams Street. Unit 2 has been much loved by its current owners who’ve hosted many a party here – friends have gathered round the kitchen island, hung out on the deck, barbecued on the patio out back, dined in the formal dining room, and spent the night on the futon in the guest room. There’s a deck off that guest room that gets great light and is perfect for container gardening – grow some fresh herbs or tomatoes just outside your door! The back deck is covered and overlooks stately nearby houses, tall trees, and the spacious fenced backyard with patio that’s shared by the three units at 31 Adams Street. You can bring Fido or Meowa with you to 31 Adams Street – the association is pet friendly and allows domestic household pets weighing up to 50 pounds. Transportation options abound near Adams Street with nearby bus routes to the Red, Green and Orange line stations and easy access to the highway. The bike path will soon be extended to Lowell Street and eventually the Green Line subway stop will be there too. Magoun Square is starting to boom and now provides a variety of options for drinks, lunch or dinner including Daddy Jones, Pennypackers Fine Food, Olde Magoun’s Saloon and more. Local favorites, Highland Kitchen and Sarma, are also an easy walk. If you’re hoping to find your next home in Somerville you’ll want to check out 31 Adams Street. 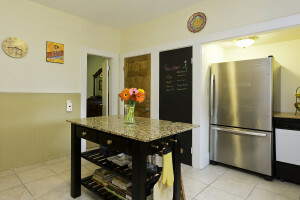 Unit 2 is new to the market and listed for $349,000. 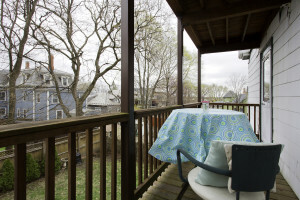 Open houses are scheduled for Saturday and Sunday, May 3rd and 4th, from 1 to 2 pm.